Why have the authorities turned a blind eye? Why have repeated complaints fallen on deaf ears? Wednesday, September 1, 2010 will be a day to remember for Ipohites. It marks the day when the Raja Muda of Perak, Raja Dr. Nazrin Shah, went on a “walkabout” to see the ugly side of the city in person. The heaps of uncollected garbage, indiscriminately disposed at illegal dump-sites, and not too well concealed, were simply revolting. What really prompted an icon of the Perak Royal family to do the inevitable? I pin it down to inertia and indifference on the part of those entrusted with the cleanliness of the city, which was once dubbed the cleanest in the country. The days of the Seenivasagam brothers are long gone and in their place came the current crop of city elders whose interest in hygiene is questionable. It took the likes of Raja Nazrin to get things moving. The episode leading to the “walkabout” started at Stadium Perak on the morning of Tuesday, August 31 when VIPs and the rakyat gathered for the annual Merdeka parade. The Raja Muda had enquired with the state police chief whether he was aware of a so-called “Zone of Pollution Fire and Noise” going by its acronym ZOPFAN. 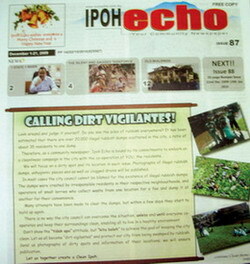 The Raja Muda was alluding to a letter written by an irate resident to Ipoh Echo. This set alarm bells ringing and soon the aide to the police chief was on his mobile calling me for details of the letter. I had never anticipated it to be that serious. After all, Ipoh Echo, as a matter of course, has been highlighting this glaring impropriety since the day of its existence. 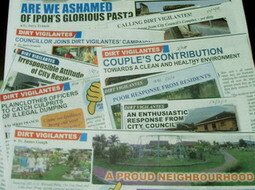 We have even encouraged our readers to become ‘dirt vigilantes’ (IE Issue 87) to oversee the menace. We front-paged the issue with this broad headline, “Calling All Dirt Vigilantes!” and implored our readers to “protect our city from being swarmed by rubbish.” They were told to send photographs of dirty spots and information of their locations for publication. This is our duty as a community newspaper. The plea however struck a chord with none other than the Raja Muda himself. The crown prince has taken it upon himself to rid the city of this blemish by visiting ZOPFAN in person. And the rest, like they say is history. Kudos to the Raja Muda for having done the unthinkable. The complainant’s fear is not unfounded. The 100-acre site is a former tin-mining area and is located below the Kek Lok Tong cave temple in Rapat Setia. It is covered with secondary vegetation, a disused mining pool and is hemmed in on all sides by housing estates. The land is privately owned and has been left idle for a long period of time. Illegal activities have taken root and are causing much inconvenience to those living nearby. Of concern to the residents is open burning which is done at night to avoid detection. Chicken farming and vegetable gardening accentuate the chaotic make-over of this little badland. It does not bode well for those wishing to enjoy some peace of mind away from the hustle and bustle of city life. Why have the authorities turned a blind eye on an otherwise sensitive spot? Why have repeated complaints fallen on deaf ears? Why the disinterest shown by those in power? Could there be a more sinister reason behind the lack of action? The answer given by the Mayor is inconsequential but if it is the gospel truth then it opens a can of worms. According to Roshidi, the Council had in the past, contacted the owner and warned him to fence up his property. However, political pressure had negated his efforts at correcting the wrong-doings. So, it is not politically right to right the wrong. This is indeed a shame. In dispensing justice the Council should act without fear or favour. It should be above board and remain impartial. The well-being of ratepayers is paramount, not that of the privileged few who have the political clout to dictate their own terms. The Raja Muda has paved the way. So, MBI it is your duty to follow through.